Sackets Harbor is a quaint community with a unique and important history – a great place to visit, and a great place to live. Whether you wish to dine at some of the finest restaurants in Northern New York, catch a Comedy show, or dock at one of our well equipped marinas, you’ll find it all in Historic Sackets Harbor. Nestled on the shores of Lake Ontario and the beautiful Black River Bay, water fun abounds! Try Sailing, Wind Surfing, Water Skiing, Swimming, White Water Rafting, and even year-round trophy fishing. You’ll enjoy plenty of other summer activities, too, including weekly Sunday Concerts on the Waterfront, Lacrosse Tournaments, Auto Shows, Memorial Day and the 4th of July, Can-Am Festival with Parade and Fireworks. And be sure not to miss our annual War of 1812 weekend where muskets and cannon resound. Just as they did 201 years ago when Sackets Harbor figured prominently in deciding the end of hostilities between the U.S and Great Britain. The Fall season overflows with colorful foliage, and Winter comes alive with Cross Country Skiing, Ice Fishing Derbies, Snowmobile Racing, and of course the Historic Christmas Tree Lighting Ceremony. 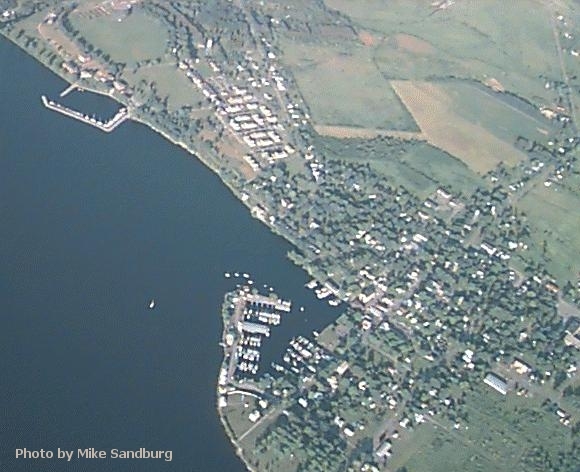 The historic village of Sackets Harbor was the United States’ most important shipbuilding center during the War of 1812. Headquarters for the U.S. Navy on the Great Lakes, it was home to thousands of shipwrights, carpenters, sailors, and soldiers gathered to construct, sail, and defend the fleet. During the War of 1812, one third of the United States Army, and a quarter of its Navy, were stationed at Sackets Harbor. Sackets Harbor’s strategic role in the War of 1812 as a defender of America’s northern frontier surprises many first-time visitors. The “Second War of Independence” with Great Britain is more commonly associated with such famous events in its southern theater as the burning of public buildings in Washington and the bombardment of Fort McHenry. But it was in Sackets Harbor that a great military and naval operation successfully defended the nation’s northern border. Were it not for Sackets Harbor, this section of the country might actually be a part of Canada today. Indeed, the entire course of American History may have been decided here. Sackets Harbor’s importance as a shipbuilding and military center continued well into the nineteenth century, leaving an abundance of interesting historically restored architecture. Today Sackets Harbor offers something unique for everyone from history buffs to sportsmen. Proudly one of The New York State Heritage Areas, Sackets Harbor is a perfect place for your next vacation – or your permanent home!